A with the wrist band, insert the plug wire end to the socket position test positive. 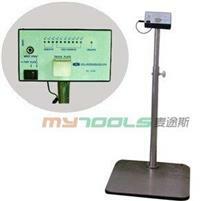 C press the TOUCH PLATE button to start the tester, tester can start in 2-3 seconds. D testing instrument panel display link resistance bands and the human body. Note: when testing, don't touch the metal parts.